Although the Jesuits do not have any parishes, schools or universities in Vietnam, they have found a way to reach out to young Catholic students. In what they call their “pastoral ministry of/for students”, they provide, in church-based settings, classes on catechism, Ignatian spirituality, and leadership to help Vietnamese Catholic students become rooted in and widely apply Ignatian spirituality in their lives, and live a life of faith. 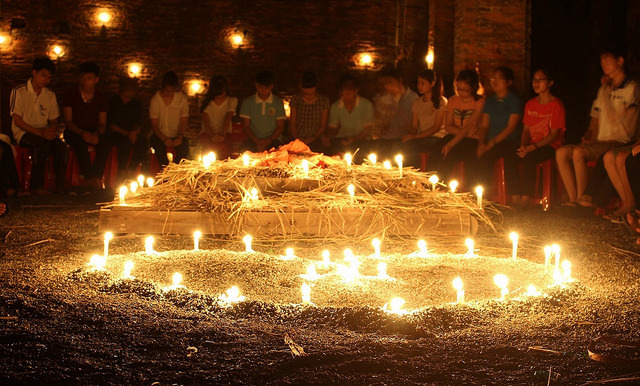 These are offered in student summer retreats the Vietnam Jesuits organise annually in July and August. The retreats are open to young people aged from 17 to 30, and guided by a Jesuit and a group of collaborators well trained in Ignatian spirituality who are mostly sisters from different congregations. Each retreat includes five days of silent prayer, and a one-day picnic. The picnic day is very important since it is the day for retreatants to get know one another better through conversations, playing games, and other activities. The giving of student summer retreats dates back to 1992 and the first was undertaken by Fr Liem Pham SJ, who is now the Provincial of Jesuits in Vietnam. The first summer retreats were organized at the request of students and given to only a small number. However, in 1995, the retreats were expanded to accommodate more retreatants, and more courses were organized in the southern part of Vietnam. In 2005, the student summer retreats were offered in the central and northern parts of Vietnam. These retreats, especially those in the north, attracted a great number of students. For example, nearly 300 students attended the retreat held at Saint Joseph Major Seminary in Hanoi. To make the retreats accessible to more students, the student summer retreats are substantially subsidized. The retreatants only pay for half the cost, the rest is paid for through the financial support of benefactors in and outside Vietnam. Today, the Jesuits conduct student summer retreats throughout the country and the number of retreatants continues to increase as does the number of retreats. In 2013, 11 retreats were held with a total of 788 students. In 2014, 13 retreats were held with a total of 1,055 retreatants. This year, 19 retreats were held with a total of 1,167 students. To reach more Vietnamese Catholic students, there are now plans to organize more retreats throughout the year because not all students are able to participate in the summer.